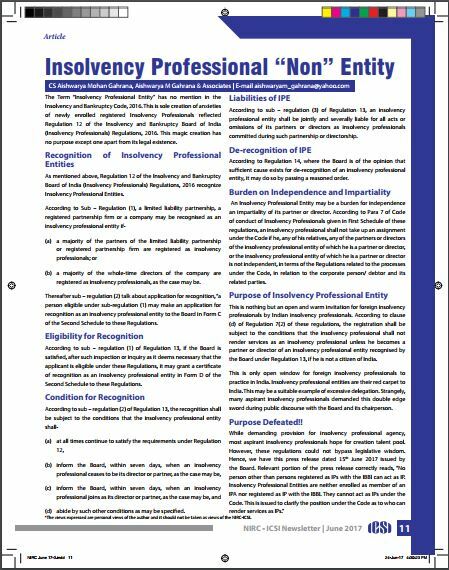 As mentioned above, Regulation 12 of the Insolvency and Bankruptcy Board of India (Insolvency Professionals) Regulations, 2016 recognize Insolvency Professional Entities. Thereafter sub – regulation (2) talk about application for recognition, “a person eligible under sub-regulation (1) may make an application for recognition as an insolvency professional entity to the Board in Form C of the Second Schedule to these Regulations. According to sub – regulation (1) of Regulation 13, if the Board is satisfied, after such inspection or inquiry as it deems necessary that the applicant is eligible under these Regulations, it may grant a certificate of recognition as an insolvency professional entity in Form D of the Second Schedule to these Regulations. According to sub – regulation (3) of Regulation 13, an insolvency professional entity shall be jointly and severally liable for all acts or omissions of its partners or directors as insolvency professionals committed during such partnership or directorship. According to Regulation 14, where the Board is of the opinion that sufficient cause exists for de-recognition of an insolvency professional entity, it may do so by passing a reasoned order. An Insolvency Professional Entity may be a burden for independence an impartiality of its partner or director. According to Para 7 of Code of conduct of Insolvency Professionals given in First Schedule of these regulations, an insolvency professional shall not take up an assignment under the Code if he, any of his relatives, any of the partners or directors of the insolvency professional entity of which he is a partner or director, or the insolvency professional entity of which he is a partner or director is not independent, in terms of the Regulations related to the processes under the Code, in relation to the corporate person/ debtor and its related parties. This is nothing but an open and warm invitation for foreign insolvency professionals by Indian insolvency professionals. According to clause (d) of Regulation 7(2) of these regulations, the registration shall be subject to the conditions that the insolvency professional shall not render services as an insolvency professional unless he becomes a partner or director of an insolvency professional entity recognised by the Board under Regulation 13, if he is not a citizen of India. This is only open window for foreign insolvency professionals to practice in India. 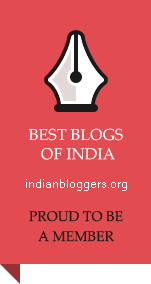 Insolvency professional entities are their red carpet to India. This may be a suitable example of excessive delegation. Strangely, many aspirant insolvency professionals demanded this double edge sword during public discourse with the Board and its chairperson. This entry was posted in Insolvency and Bankruptcy Code 2016 and tagged IBBI, Insolvency and Bankruptcy Board of India, Insolvency and Bankruptcy Board of India (Insolvency Professionals) Regulations 2016, Insolvency Professional, Insolvency Professional Entity, IP, IPE. Bookmark the permalink.